Here it is ! 15 years after its creation, Australia’s most outrageous and shocking band finally release their first DVD ! Get ready for the best… and the worst ! The bad guys of BLÖOD DÜSTER strike again with their patented self depreciating sense of humour, and this time you can see it with your own eyes ! Creating and implementing both musical and social havoc for over a decade now with their very own mix of influences ranging from early grindcore bands like NAPALM DEATH and CARCASS to elements from 70’s rock bands, BLÖOD DÜSTER are responsible for some of the most infamous album releases of all time. 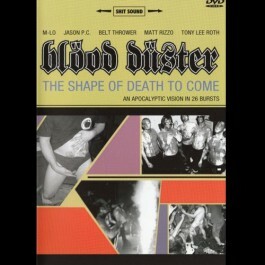 But BLÖOD DÜSTER’s strength truly lies in their live show, because that’s exactly what it is – a show. Unlike most bands passing themselves off as entertainment, BLÖOD DÜSTER deliver, with anything from underage girls voluntarily de-robing onstage, to fireworks extravaganzas full of old-school goodness. Witness the band’s terrific, controversial, unpolitically correct and hysterically funny video clips, live performances and off-stage footage, but take care not to let the kids watch !